Disclosed is a method for producing an α-olefin polymer, the method comprising a step for polymerizing one or more types of C4-20 α-olefins by using a polymerization catalyst that is made by using (A) a specific double-crosslinked metallocene compound, (B) an ionic compound capable of reacting with said double-crosslinked metallocene compound and transforming the same into a cation, and (C) an organometallic compound, wherein the molar ratio of said ionic compound (B) to said double-crosslinked metallocene compound (A) is greater than or equal to 0.5 and less than 1.0. The present invention relates to a process for the preparation of α- olefin polymers and hydrogenated α- olefin polymer. A characteristic that has been sought in the lubricating oil for automobiles and industrial machines to date, there may be mentioned that a relatively high viscosity from the viewpoint of lubricating performance, due to environmental considerations in recent years has become a problem, further becomes low fuel consumption, energy saving, and long life is desired, as compared with the conventionally used poly α- olefins such as, superior viscosity properties (high viscosity index), low-temperature characteristics (low temperature fluidity), synthetic lubricating oils having an oxidative stability is desired. Conventional hydrocarbon-based synthetic lubricating oils, for example, using aluminum or aluminum bromide chloride to catalyst, a method for polymerizing 1-decene and 1-decene and 1-dodecene (Patent Document 1). However, the resulting α- olefin polymer viscosity index and pour point, the durability was not sufficient. However, many catalyst amount used in the method described in Patent Documents 2-8 and 14, requires a high pressure of hydrogen in the method described in Patent Documents 7-8, a large amount by the method described in Patent Documents 9-13 etc. requiring hydrogen, or high cost of the catalyst and hydrogen to produce a high-performance α- olefin copolymer, requires a special high pressure apparatus, with a small amount of catalyst, and a special development of production methods that do not require manufacturing apparatus has been desired. The present invention has been made in view of the above circumstances, it is an object to provide a method for efficiently producing α- olefin polymers and hydrogenated α- olefin polymer using a metallocene compound. The present inventors have conducted intensive result of extensive research, when performing polymerization of α- olefins using a metallocene compound having a ligand in which two cyclopentadiene rings is formed by a double bridge, the double cross-linked metallocene compound It found that improved reaction efficiency by reacting with an extremely small amount of the amount of ionic compound which can be converted into cations and found that it is possible to solve the above problems. The present invention has been completed based on these findings. That is, the present invention is to provide a present invention described below. 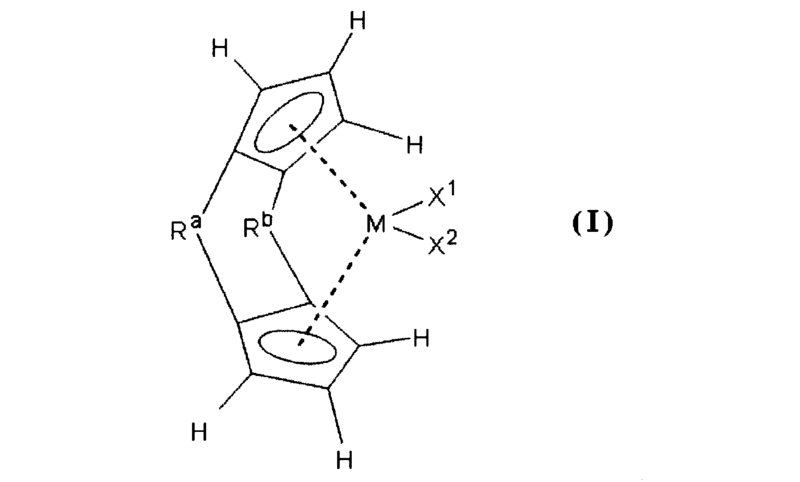 (A) two cross-linked metallocene compound represented by the following general formula (I), (B) a above two bridged metallocene compound reacting with ionic compounds may be converted into cations, and (C) an organometallic compound , above using polymerization catalyst molar ratio (a) for two bridged metallocene compound (B) an ionic compound is used in 0.5 and 1.0, the number 4 ~ 20 alpha-olefins one or more carbon atoms method for producing α- olefin polymer characterized by having a step of polymerizing. (B) the ionic compound, method for producing α- olefin polymer according to a coordination complex compound represented by the following general formula (2) or (3) . M 2 and M 3 in the general formula (2) and (3) The method of α- olefin polymer according to boron . (B) the ionic compound comprises a cationic, alpha-olefin polymer according to a coordination complex compound comprising a non-coordinating anion represented by the following general formula (4)  the method of production. R 11 ~ R 14 in the general formula (4) are each independently method for producing α- olefin polymer according to a substituted or unsubstituted phenyl group . (A) the two cross-linked to metallocene compound (B) molar ratio of the ionic compound is 0.5 to 0.9  ~ alpha-olefin polymer according to any one of  the method of production. The (C) organometallic compound is an organoaluminum compound or an organozinc compound  to the production method of the α- olefin polymer according to any one of . The method for producing α- olefin polymer according to any one of the carbon atoms of the α- olefin is 8-14  to . the kinematic viscosity at 100 ° C. of the resulting α- olefin polymer is 30 ~ 1000mm 2 / s [1 ] ~ method for producing α- olefin polymer according to any one of . to produce a α- olefin polymer by the method according to any one of , further hydrogenated α- olefin heavy that the α- olefin polymer characterized by hydrogenating manufacturing method of the united. The method for producing a hydrogenated α- olefin polymer according to is the kinematic viscosity at 100 ° C. of hydrogenated α- olefin polymer is 30 ~ 1000mm 2 / s [10 ] obtained. According to the present invention, it is possible to provide a method for efficiently producing α- olefin polymers and hydrogenated α- olefin polymer using a metallocene compound. Method for producing α- olefin polymer of the present invention, (A) two cross-linked metallocene compound represented by the following formula (I), ionic which can be converted into cations by reacting (B) and the two-crosslinked metallocene compound compound, and (C) an organometallic compound, using the above (a) two (B) for the bridged metallocene compound polymerization catalyst molar ratio of the ionic compound is used in 0.5 and 1.0, carbon It characterized by having a step of polymerizing the number 4 ~ 20 alpha-olefins one or more. Incidentally, alpha-olefin polymer produced by the present invention include copolymers prepared a plurality of kinds of alpha-olefins as raw materials. The (A) two bridged metallocene compound (A) above two bridged metallocene compounds, it is used those represented by the following general formula (I). (Wherein, X 1 and X 2 are each independently a hydrogen atom, a halogen atom, a hydrocarbon group of 1 to 20 carbon atoms or a halogen atom, a silicon atom, an oxygen atom, sulfur atom, nitrogen atom and phosphorus atom .M showing an organic group having 1 to 20 carbon atoms containing at least one atom selected represents a 4-6 transition metal of the periodic table, preferably zirconium, titanium or hafnium. R a and R b are each independently, - [L (R 1) (R 2)] n - is a linking group represented by, and preferred examples thereof, -C (R 1) (R 2) - , -Si (R 1) (R 2) -, - C (R 1) (R 2) -C (R 1) (R 2) -, and -Si (R 1) (R 2 ) -Si (R 1) (R 2) - and the like. n is an integer of 1 to 3. R 1 and R 2 are each independently a hydrogen atom, a halogen atom, a hydrocarbon group of 1 to 20 carbon atoms, or a halogen-containing hydrocarbon group having 1 to 20 carbon atoms, preferably having a hydrogen atom or a C 1 1-4 hydrocarbon group, more preferably a hydrogen atom or an alkyl group having 1 to 4 carbon atoms. Specific examples of the secondary crosslinked metallocene compound represented by the general formula (I), (1,1'-ethylene) (2,2'-ethylene) bis cyclopentadienyl zirconium dichloride, (1,1'- dimethylsilylene) (2,2'-dimethylsilylene) bis (cyclopentadienyl) zirconium dichloride, (1,1'-dimethylsilylene) (2,2'-ethylene) bis cyclopentadienyl zirconium dichloride, (1, 1 ' - isopropylidene) (2,2'-dimethylsilylene) bis (cyclopentadienyl) zirconium dichloride, (1,1'-isopropylidene) (2,2'-isopropylidene) bis (cyclopentadienyl) zirconium dichloride dichloro body such as chloride and dimethyl body of the above compounds, diethyl body, dihydro derivative, diphenyl body, dibenzyl and the like arrangement These titanium, hafnium complex can be exemplified. As a secondary bridged metallocene compounds used as component (A) may be used singly or may be used in combination of two or more. In the production method of the present invention, used is one or more kinds selected from (B) above metallocene compound and reacting with one or more selected from ionic compounds which can be converted into cations, and (C) an organometallic compound . The (B) the ionic compound component (B), wherein (A) if a two bridged metallocene compound ionic compound capable of reacting with converted into cations and ingredients, can be used in any of those, cationic and non is preferably a coordination complex compound having a coordinating anion, may be suitably used those represented by the following general formula (2) or (3). Here, specific examples of L 1 include amines such as ammonia, methylamine, aniline, dimethylamine, diethylamine, N- methylaniline, diphenylamine, N, N- dimethylaniline, trimethylamine, triethylamine, tri -n- butylamine, methyl diphenylamine, pyridine, p- bromo -N, N- dimethylaniline, p- nitro -N, amines such as N- dimethylaniline, triethylphosphine, triphenylphosphine, phosphine such as diphenylphosphine, thioethers such as tetrahydrothiophene, benzoic esters such as ethyl, acetonitrile, nitriles such as benzonitrile, and the like. In the general formula (3), L 2 is M 4, represents the (R 15) (R 16) M 5 or (R 17) 3 C. R 15 and R 16 are each independently a cyclopentadienyl group, substituted cyclopentadienyl group, an indenyl group or a fluorenyl group, R 17 represents an alkyl group having 1 to 20 carbon atoms, 6 to 20 carbon atoms an aryl group, an alkyl aryl group. M 4 is a metal selected from Group 1 and 8 to Group 12 of the periodic table, M 5 represents a metal selected from Groups 8-10 of the periodic table, as the metal M 4, silver, copper, sodium, lithium is preferred as the metal M 5, iron, cobalt, and nickel are preferable. Here, specific examples of R 15, R 16, there can be mentioned cyclopentadienyl group, methylcyclopentadienyl group, ethylcyclopentadienyl group, and the like pentamethylcyclopentadienyl group. Specific examples of R 17, there can be mentioned a phenyl group, p- tolyl group, a p- methoxyphenyl group. Specific examples of M 4 can be mentioned Li, Na, K, Ag, Cu, Br, I, etc. I 3, specific examples of M 5, Mn, Fe, Co , Ni, Zn and the like. In the general formula (2) and (3), g is [L 1 -R 3], [ L 2] ionic valence integer of 1 to 7, f is an integer of 1 or more, l = [f × g / is a (n-m)]. [M 2 D 1 D 2 ··· D n] (nm) - and [M 3 D 1 D 2 ··· D n] (nm) - represents an anion in which a plurality of groups are bonded to an element, M 2 and M 3 each independently represents an element selected from the 5-15 of the periodic table, preferably a periodic table 13-15 group element. D 1 ~ D n are each independently a hydrogen atom, an alkyl group having 1 to 20 carbon atoms, an alkoxy group having 1 to 20 carbon atoms, a dialkylamino group having 2 to 40 carbon atoms, the ring carbon atoms of 6 to 20 an aryloxy group, an aryl group ring carbon atoms of 6 to 20, a halogen-substituted aryl group having ring carbon atoms of 6 to 20, alkyl aryl, halogen substituted alkylaryl groups having 7 to 21 carbon atoms of 7 to 21 carbon atoms, arylalkyl group having 7 to 21 carbon atoms, a substituted alkyl group having 1 to 20 carbon atoms, an organic metalloid group or a halogen atom shown. D 1 two or more of the ~ D n may be bonded together to form a ring. n is an integer of 2 to 8. Here, specific examples of M 2 and M 3, boron, aluminum, silicon, phosphorus, arsenic, antimony are preferred, boron is preferred. Specific examples of D 1 ~ D n is a dimethylamino group as a dialkylamino group, a diethylamino group, the alkoxy group or an aryloxy group, a methoxy group, an ethoxy group, n- propoxy group, phenoxy group, an alkyl group as a methyl group, an ethyl group, n- propyl group, an isopropyl group, n- butyl group, an isobutyl group, n- octyl group, a n- eicosyl group, aryl group, phenyl group, the alkyl aryl group, p- tolyl, 4-t-butylphenyl group, a 3,5-dimethylphenyl group, a benzyl group as the aryl alkyl group, halogen atom, fluorine, chlorine, bromine, iodine, halogen-substituted aryl group, p- fluorophenyl group, 3,5-difluorophenyl group, pentachlorophenyl group, 3, , 5-trifluorophenyl group, pentafluorophenyl group, a halogen-substituted alkylaryl group, 3,5-bis (trifluoromethyl) phenyl group, bis (trimethylsilyl) such as a methyl group, as the organic metalloid group, pentamethyl antimony group, trimethylsilyl group, trimethylgermyl group, diphenylarsine group, dicyclohexyl antimony group, and a diphenyl borate containing group. As the coordination complex compound (B) above ionic compound, a cation, it is also preferably used one having a non-coordinating anion represented by the following general formula (4). Examples of non-coordinating anion in which a plurality of groups are bonded to a metal according to the above-mentioned general formula (2) to (4), B (C 6 F 5) 4 -, B (C 6 HF 4) 4 -, B (C 6 H 2 F 3) 4 -, B (C 6 H 3 F 2) 4 -, B (C 6 H 4 F) 4 -, B [C 6 (CF 3) F 4] 4 -, B (C 6 H 5 ) 4 -, FB (C 6 F 5) 3 -, FB (C 10 F 7) 3 -, PF 6 -, P (C 6 F 5) 6 -, Al (C 6 F 5) 4 -, Al ( C 6 HF 4) 4 -, FAl (C 6 F 5) 3 -, FAl (C 10 F 7) 3 - , and the like preferably. Meanwhile, specific examples of metal cations used as the cation of the above (B) an ionic compound, Cp 2 Fe +, (MeCp ) 2 Fe +, (tBuCp) 2 Fe +, (Me 2 Cp) 2 Fe + , (Me 3 Cp) 2 Fe +, (Me 4 Cp) 2 Fe +, (Me 5 Cp) 2 Fe +, as Ag +, Na +, Li + and the like preferably, also other cations, pyridinium, 2,4-dinitro -N, N-diethyl anilinium, diphenyl ammonium, p- nitro anilinium, 2,5-dichloro-anilinium, p- nitro -N, N-dimethylanilinium, quinolinium, N, N - dimethyl anilinium, N, the nitrogen-containing cations such as N- diethyl anilinium, triphenylcarbenium, tri (4-methylphenyl) carbenium, Li (4-methoxyphenyl) carbenium cation such as carbenium, CH 3 PH 3 +, C 2 H 5 PH 3 +, C 3 H 7 PH 3 +, (CH 3) 2 PH 2 +, (C 3 H 5 ) 2 PH 2 +, (C 3 H 7) 2 PH 2 +, (CH 3) 3 PH +, (C 2 H 5) 3 PH +, (C 3 H 7) 3 PH +, (CF 3) 3 PH +, (CH 3) 4 P +, (C 2 H 5) 4 P +, (C 3 H 7) 4 P + alkyl phosphonium cations such as, and C 6 H 5 PH 3 +, (C 6 H 5 ) 2 PH 2 +, (C 6 H 5) 3 PH +, (C 6 H 5) 4 P +, (C 2 H 5) 2 (C 6 H 5) PH +, (CH 3) (C 6 H 5) PH 2 +, (CH 3) 2 (C 6 H 5) PH +, and the like (C 2 H 5) 2 ( C 6 H 5) 2 P + aryl phosphonium cations such as. The ionic compound represented by the general formula (2), for example, tetraphenyl borate triethylammonium, tri (n- butyl) tetraphenylborate ammonium, trimethylammonium tetraphenylborate, tetrakis (pentafluorophenyl) borate triethylammonium tetrakis (pentafluorophenyl) borate tri (n- butyl) ammonium, hexafluoroarsenate periodate triethylammonium tetrakis (pentafluorophenyl) borate pyridinium tetrakis (pentafluorophenyl) borate pyrrolinium tetrakis (penta fluorophenyl) borate N, N-dimethylanilinium tetrakis (pentafluorophenyl) methyl diphenyl ammonium borate, tetraphenylborate triethylamine Moniumu, tri -n- butylammonium tetraphenylborate, trimethylammonium tetraphenylborate, tetraphenyl borate tetraethyl ammonium, tetraphenyl borate methyl (tri -n- butyl) ammonium, tetraphenyl borate benzyl (tri -n - butyl) ammonium, dimethyl diphenyl ammonium tetraphenyl borate, triphenyl (methyl) ammonium tetraphenylborate, tetraphenyl borate trimethyl anilinium tetraphenyl borate methylpyridinium, tetraphenylborate benzyl pyridinium, tetraphenyl borate methyl (2-cyanopyridinium) tetrakis (pentafluorophenyl) triethylammonium borate, tetrakis (pentafluorophenyl) e Acid tri -n- butylammonium tetrakis (pentafluorophenyl) triphenyl ammonium borate, tetrakis (pentafluorophenyl) borate tetra -n- butylammonium tetrakis (pentafluorophenyl) tetraethylammonium borate, tetrakis (pentafluorophenyl phenyl) borate benzyl (tri -n- butyl) ammonium tetrakis (pentafluorophenyl) methyl borate diphenyl ammonium tetrakis (pentafluorophenyl) borate tri phenyl (methyl) ammonium tetrakis (pentafluorophenyl) methyl borate anilinium tetrakis (pentafluorophenyl) borate dimethylanilinium tetrakis (pentafluorophenyl) borate trimethyl anilinium , Tetrakis (pentafluorophenyl) borate methylpyridinium tetrakis (pentafluorophenyl) borate benzyl pyridinium tetrakis (pentafluorophenyl) methyl borate (2-cyano-pyridinium), tetrakis (pentafluorophenyl) borate benzyl (2 - cyanopyridinium) tetrakis (pentafluorophenyl) methyl borate (4-cyano-pyridinium), tetrakis (pentafluorophenyl) borate triphenylphosphonium tetrakis [bis (3,5-di-fluoromethyl) phenyl] boronic acid dimethyl anilinium and the like. As the ionic compound represented by the general formula (3), for example, tetraphenyl borate ferrocenium tetrakis (pentafluorophenyl) borate ferrocenium tetrakis (pentafluorophenyl) borate dimethyl ferrocenium tetrakis ( pentafluorophenyl) borate decamethyltetrasiloxane ferrocenium tetrakis (pentafluorophenyl) acetyl borate ferrocenium tetrakis (pentafluorophenyl) borate formyl ferrocenium tetrakis (pentafluorophenyl) borate cyano ferrocenium , tetraphenylborate, silver tetrakis (pentafluorophenyl) borate, silver tetraphenylborate trityl tetrakis (pentafluorophenyl) borate trityl, hexafluoroarsenate periodate silver, hexa Le Oro antimony, silver, etc. silver tetrafluoroborate are preferably exemplified. Tetraphenylborate ferrocenium tetraphenyl borate, silver tetraphenyl borate trityl, tetraphenylborate tetraphenylporphyrin manganese tetrakis (pentafluorophenyl) borate ferrocenium tetrakis (pentafluorophenyl) borate (1, 1 ' - dimethyl ferrocenium), tetrakis (pentafluorophenyl) borate decamethyltetrasiloxane ferrocenium tetrakis (pentafluorophenyl) borate, silver tetrakis (pentafluorophenyl) borate trityl tetrakis (pentafluorophenyl) borate, lithium , tetrakis (pentafluorophenyl) sodium borate, tetrakis (pentafluorophenyl) borate tetraphenylporphyrin manganese, silver tetrafluoroborate, Hekisafuru Ororin silver hexafluoroarsenate periodate silver, silver perchlorate, silver trifluoroacetate, and the like of silver trifluoromethanesulfonate. Specific examples of the coordination complex compound having a non-coordinating anion represented by the general formula (4), among those described above, anions include those represented by the general formula (4). Component (B) may be used alone, or may be used in combination of two or more. 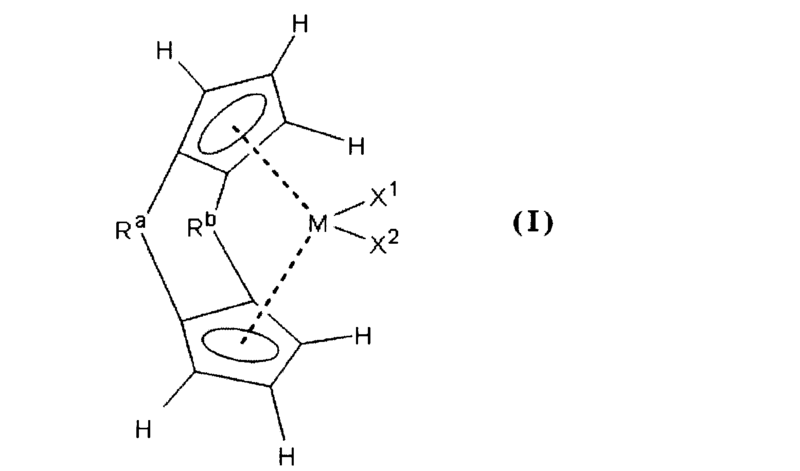 In the production method of the α- olefin polymer present invention, as described above, (A) two bridged metallocene compounds for (B) a molar ratio of 0.5 and 1.0 of the ionic compound (preferably 0. it is characterized in the use of 5 to 0.9 mol). Generally, the amount of the metallocene compound (B) in order to sufficiently exhibit the activity in the polymerization of α- olefins using a catalyst comprising ionic compound (B) an ionic compound equal respect metallocene compound there is a need for more moles. Exists which, alpha-olefin to be polymerized must metallocene compound is cationic, all metallocene compound and the cation is a counter anion (B) an ionic compound at least equimolar to the reaction system it due to the fact that is the essential condition to be. However, the present inventors have found that improved (A) the molar ratio of component (B) to component performs the polymerization reaction of α- olefin and less than 1.0 area, rather active. 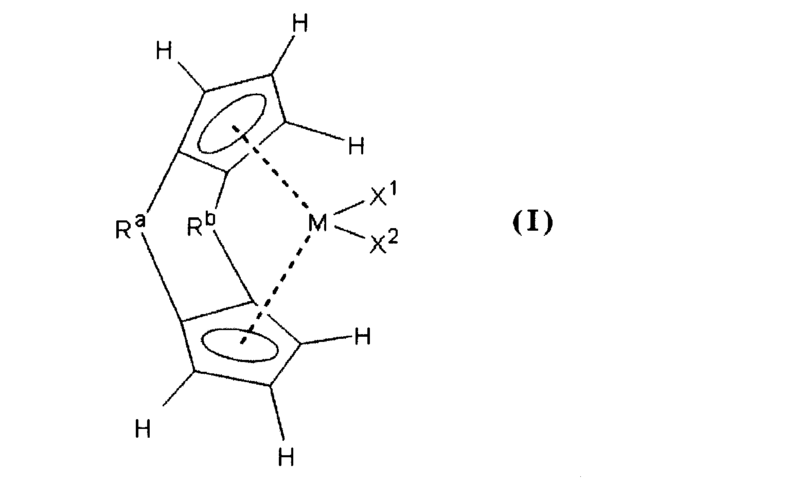 This is used in the present invention (A) metallocene compound (B) component and (C) when contacted components to the monomer and dimer are mixed, and, dimer in monocation It is presumed as by present. More specifically, in the manufacturing method of the present invention preferably satisfies the following (i) or (ii). On the two cross-linked metallocene compound represented by (i) the general formula (I), the total amount of the above general formula (2) and all of the compounds represented by at least one of (3) is, in a molar ratio 0 less .5 or 1.0 (preferably 0.5 to 0.9 or less). On the two cross-linked metallocene compound represented by (ii) the general formula (I), the total amount of all compounds having a non-coordinating anion represented by the general formula (4), in a molar ratio 0 less .5 or 1.0 (preferably 0.5 to 0.9 or less). The (C) an organometallic compound (C) an organometallic compound, it is preferably used which is selected from an organic aluminum compound and an organic zinc compound. As the organoaluminum compound, compounds represented by the general formula (VII) is used. The organozinc compound, the compound represented by the general formula (VIII) is used. Specific examples of the general formula organoaluminum compound represented by (VII), trimethyl aluminum, triethyl aluminum, tri-n-propyl aluminum, triisopropyl aluminum, tri-n-butylaluminum, triisobutylaluminum, tri-heptyl aluminum, trioctyl aluminum, diisobutylaluminum hydride, diethylaluminum hydride, dimethylaluminum chloride, diethylaluminum chloride, methyl aluminum dichloride, ethyl aluminum dichloride, dimethyl aluminum fluoride, ethylaluminum sesquichloride and the like. Specific examples of the organic zinc compound represented by the general formula (VIII), dimethyl zinc, diethyl zinc, dibutyl zinc, can be exemplified dioctyl zinc. Component (C) may be used alone, or may be used in combination of two or more. The ratio of the present invention (A) and component (C) is a 1 preferably molar ratio: 1 to 1: 10,000, more preferably 1:10 to 1: 1,000. In the present invention, the component (A) may be contacted with the component (B) and (C) contacting the ingredients may be formed a polymerization catalyst, further the components in the presence of other ingredients . Although the contacting step can be carried out in the presence or absence of a carrier, in the case of using a carrier, at least one of the catalyst components supported on an appropriate carrier, for the polymerization in contact with other components to form a catalyst. This for the type of carrier is not particularly limited, inorganic oxide support, the other can be used any of inorganic carriers and organic carriers, inorganic oxide carriers or other inorganic carriers, especially in terms of morphology control It is preferred. The inorganic oxide support, specifically, SiO 2, Al 2 O 3 , MgO, ZrO 2, TiO 2, Fe 2 O 3, B 2 O 3, CaO, ZnO, BaO, ThO 2 and mixtures thereof It may include, for example, silica-alumina, zeolite, ferrite, and glass fibers. Among these, particularly SiO 2, Al 2 O 3 preferably. The above inorganic oxide support, small amounts of carbonates, nitrates, and may contain sulfate or the like. On the other hand, as a carrier other than the above, MgCl 2, Mg (OC 2 H 5) generally represented by magnesium compounds such as 2 formula Mg (R 17) Magnesium represented by a X b compounds and and the like complex salts thereof can. Here, R 17 represents an alkyl group, an alkoxy group or an aryl group of 6 to 20 carbon atoms having 1 to 20 carbon atoms, X is a halogen atom or an alkyl group having 1 to 20 carbon atoms having 1 to 20 carbon atoms, a is 0-2, b is 0-2, and is a + b = 2. Each R 17 and X may be each the same or may be different. As the organic carrier, polystyrene, styrene - can be exemplified divinylbenzene copolymer, polyethylene, polypropylene, substituted polystyrene, copolymer or starch such as polyarylate, carbon and the like. The carrier used in the present invention, MgCl 2, MgCl (OC 2 H 5), Mg (OC 2 H 5) 2, such as SiO 2, Al 2 O 3 is preferred. The properties of the carrier are varied depending on the type and production method, the average particle size is usually 1 ~ 300 [mu] m, preferably 10 ~ 200 [mu] m, more preferably 20 ~ 100 [mu] m. Increases the fine powder of the α-olefin (co) in the polymer particle diameter is small, increase coarse particles of α-olefin (co) in the polymer particle size is large, cause clogging of reduction and the hopper bulk density . The specific surface area of the carrier is usually 1 ~ 1,000m 2 / g, preferably 50 ~ 500m 2 / g, pore volume is usually 0.1 ~ 5cm 3 / g, preferably 0.3 ~ 3 cm 3 / a g. If any of the specific surface area or the pore volume deviates from the above range, the catalytic activity is reduced. The specific surface area and pore volume, for example can be determined from the volume of nitrogen gas adsorbed in accordance with BET method ( "J.Am.Chem.Soc., 60,309 (1983)" reference). Furthermore, the carrier is usually 0.99 ~ 1,000 ° C., preferably it is desirable to use calcined at 200 ~ 800 ° C..
Case of carrying at least one to the support of the catalyst components, (A), (B), and at least one component of the component (C), preferably (A), (B), and (C) all components to be supported. This carrier, (A) component and the (B) component, for the method for supporting at least one component of the component (C) is not particularly limited, for example, (A) component and (B), (C) component at least one and a method of mixing the carrier, after treating the support with a halogen-containing silicon compound, in an inert solvent (a) component and the (B) component, a method of mixing at least one of the component (C), carrier component (a) and / or (B) component and / or component (C) a method of reacting a halogen-containing silicon compound, the component (a) or (B) component or the (C) component was supported on a carrier later, a method of mixing with the remaining two components, a method of contacting the reactants may be combined with the carrier with components (a) and (B) component (C), components (a) and (B) component and (C) upon contact reactions with components, methods coexist carrier It can be used. The catalyst thus obtained is once performed distilling off the solvent may be used in the polymerization from taking out as a solid, may be used for polymerization as it is. In the present invention, it is possible to produce a catalyst by performing (A), (B) the carrying operation of the component and (C) at least one component of component carriers in a polymerization system. For example, addition of at least one and a carrier of the component (A) and component (B), the gaseous olefins such as propylene in addition atmospheric pressure - 2 MPa, perform 1 minute to about 2 hours prepolymerization -20 ~ 200 ° C. by a method such as by adding a liquid α-olefin, such as methods and hexene perform 1 minute to about 2 hours prepolymerization -20 ~ 200 ° C., can be used to produce catalyst particles. In the present invention, use ratio of the component (B) to the carrier is in the mass ratio, preferably from 1: 5 to 1: 10,000, more preferably 1:10 to 1: it is desirable to 500. (C) The ratio between the component and the carrier, a weight ratio, preferably 1: 0.5 to 1: 1,000, more preferably 1: 1 to 1: preferably from 50. Catalyst component (B), in the case of using a mixture of (C), (B) component, it is desirable that in the above range in the proportion mass ratio of the component (C) and a carrier. The proportion of the component (A) to the carrier, a weight ratio, preferably 1: 5 to 1: 10,000, more preferably 1:10 to 1: it is desirable to 500. As the catalyst in the present invention, the component (A) and component (B) may be those mainly containing the component (C). Wherein (B), (C) using the ratio of the proportion and the (A) and the support of ingredient and the carrier is desirably in a weight ratio within said range. The component (B), the proportion of outside the above range (C) and the proportion of the ingredient and the carrier, or (A) and the support, the activity decreases. The average particle diameter of the thus catalyst prepared is usually 2 ~ 200 [mu] m, preferably 10 ~ 150 [mu] m, particularly preferably 20 ~ 100 [mu] m, the specific surface area is generally 20 ~ 1,000m 2 / g, preferably it is a 50 ~ 500m 2 / g. Average particle size may be increased fine in the polymer is less than 2 [mu] m, sometimes coarse particles in the polymer exceeds a 200μm increases. There is the specific surface area decreases the activity is less than 20 m 2 / g, sometimes bulk density of the polymer exceeds 1,000 m 2 / g is reduced. Further, in the catalyst of the present invention, the transition metal content in the carrier 100g is usually 0.05 ~ 10 g, it is particularly preferably 0.1 ~ 2 g. When the amount of the transition metal is outside the above range, the activity is lowered. Thus it is possible to industrially advantageous production method by supported on a carrier. The α- olefin in the present invention are used those having 4 to 20 carbon atoms, e.g., propylene, 1-butene, 1-pentene, 1-hexene, 4-methyl-1-pentene, 1-heptene, 1 - octene, 1-nonene, 1-decene, 1-undecene, 1-dodecene, 1-tetradecene, 1-pentadecene, 1-hexadecene, 1-heptadecene, 1-octadecene, 1-nonadecene, 1-icosene , etc., and these one or two or more may be used. Among them availability and inexpensive easy, more preferably those having 6 to 16 carbon atoms, particularly preferably those having 8 to 14 carbon atoms. α- olefin may be used as it is the polymerization reaction but, activated alumina, impurities when used in treatment with an adsorbent such as molecular sieve is removed, preferably from improved activity. In the present invention, the polymerization method is not particularly limited, bulk polymerization, solution polymerization, suspension polymerization, slurry polymerization, gas phase polymerization method, any method may be used, such as. The polymerization conditions, the polymerization temperature is generally 0 ~ 200 ° C., preferably from 30 ~ 0.99 ° C., more preferably 40 ~ 120 ° C.. The proportion of the catalyst to the raw material monomer, the raw material monomer / component (A) (molar ratio) is 1 to 108, it is particularly preferable to be 100 to 10 6. Furthermore, polymerization time is usually 5 minutes to 20 hours, the reaction pressure is normal pressure ~ 0.2 MPaG is preferred. It is preferably carried out without solvent in view of productivity in the manufacturing method of the present invention, it is also possible to use a solvent. In that case, for example, benzene, toluene, xylene, aromatic hydrocarbons such as ethylbenzene, cyclopentane, cyclohexane, alicyclic hydrocarbons such as methylcyclohexane, pentane, hexane, heptane, aliphatic hydrocarbons such as octane, chloroform, or the like can be used halogenated hydrocarbons such as dichloromethane. These solvents may be used alone, or in combination of two or more kinds. May also be used monomers such as 1-butene as a solvent. In the method for producing α- olefin polymer of the present invention, when the polymerization of α- olefins, the activity is improved by the addition of hydrogen. Hydrogen partial pressure when using hydrogen is usually not more than 0.2 MPaG, and preferably 0.1MPaG less. In the present invention, it is possible to carry out preliminary polymerization using the polymerization catalyst. Prepolymerization, the catalyst components, for example, can be carried out by contacting a small amount of olefin is not particularly limited in the method, it is possible to use a known method. No particular limitation is imposed on the olefins used in the prepolymerization, for example, it can be mentioned such as α- olefin, or mixtures thereof having 3 to 30 carbon atoms, advantageously be made of the same olefin as the monomer used in the polymerization is there. The preliminary polymerization temperature is usually -20 ~ 200 ° C., preferably -10 ~ 130 ° C., more preferably 0 ~ 80 ° C.. In the preliminary polymerization, as a solvent, inert hydrocarbon may be used aliphatic hydrocarbons, aromatic hydrocarbons, monomers, and the like. These particularly preferred are aliphatic hydrocarbons in an aromatic hydrocarbon. The preliminary polymerization may be carried out in the absence of a solvent. In prepolymerization, preferably the amount of the preliminary polymerization product to the transition metal component per 1 mmol of the catalyst to adjust the conditions so that 1 ~ 10,000 g, particularly 1 ~ 1,000 g. Come to be stably express activity by performing prepolymerization, also the storage stability is improved. In the production method of the present invention, as a method of controlling the molecular weight of α- olefin polymer, the type of each catalyst component, the amount used, reaction volume, there is a method of adding methods and diluting solvent for selecting the polymerization temperature. When using α- olefin polymer as a lubricating oil and additives, it is preferable to remove the monomer or oligomer component after the polymerization step. As removal method, for example, a method for performing distillation under reduced pressure, and the like. Also, alpha-olefin polymer to the hydrogenation treatment, it is preferable from the viewpoint of improving stability of hydrogenated alpha-olefin polymers. As the method of hydrogenation can be used known methods are not particularly limited. According to the production method of the present invention, the viscosity characteristics (viscosity index), to produce a small amount of catalyst useful α- olefin polymer as a low-temperature characteristics (low temperature fluidity) and high viscosity lubricating base oil having excellent oxidation stability it can also be easily manufactured in industrial. Here, the "industrially easily manufactured", for example, the pressure during production requires only less and the low-pressure 0.2 MPa, easily controlled with adaptable relatively mild if steam heating type reactor reacting at a temperature 40 ℃ ~ 120 ℃, it refers to such that it does not require a step of diluting with an inert solvent. Also, like controlling the reaction temperature, by controlling the reaction conditions, it can be varied widely useful range of properties such as viscosity and viscosity index of the product as a high-viscosity lubricating base oil. Kinematic viscosity at 100 ° C., as measured in accordance with JISK2283 of obtained by the present invention α- olefin polymers and hydrogenated α- olefin polymer is preferably 30 to 1000 mm 2 / s, more preferably 30 to is a 500mm 2 / s. When 100 ° C. kinematic viscosity is less than 30 mm 2 / s, and durability when used as a high-viscosity lubricating oil component is insufficient, the 100 ° C. kinematic viscosity is 1000 mm 2 / s greater than the viscosity is too high such as fuel consumption Te becomes poor energy efficiency becomes insufficient. Moreover, kinematic viscosity at 40 ° C. as measured in accordance with JISK2283 of obtained by the present invention α- olefin polymers and hydrogenated α- olefin polymer is preferably 200 ~ 10000mm 2 / s, more preferably is a 200 ~ 5000mm 2 / s. When 40 ° C. kinematic viscosity is less than 200 mm 2 / s, the durability when used as a high-viscosity lubricating oil component is insufficient, the 40 ° C. kinematic viscosity is 5000 mm 2 / s greater than the viscosity is too high such as fuel consumption Te becomes poor energy efficiency becomes insufficient. Of the present invention by the resulting α- olefin polymer and the hydrogenated α- olefin polymer is calculated from the 40 ° C. kinematic viscosity and 100 ° C. kinematic viscosity, viscosity index (VI) from the lubrication point of view in a wide temperature range preferably 150 or more, more preferably 160 or more. Pour point was measured according to JISK2269 of α- olefin polymer obtained by the present invention is preferably -30 ° C. or less from the viewpoint of lubricity at cryogenic temperatures. Obtained by the production method of the present invention α- olefin polymer is preferably one which satisfies the characteristics of the following (i) (iv). Meso triad fraction (mm) is a stereoregularity index representing the isotacticity, 13 C-NMR known using (nuclear magnetic resonance method spectrum by carbon isotope) Documents [Macromolecules, 24,2334 (1991 ), Polymer, can be determined by the method described in 30,1350 (1989)] or the like. Resulting α- olefin polymer by the process of the present invention has a characteristic low stereoregularity, meso triad fraction (mm) is less than 40 mol%. More specifically the stereoregularity, alpha-olefin polymer using a metallocene catalyst becomes a structure with every other side chain carbon of the alpha-olefin chain members (main chain), the side chains in two directions sterically different structures by relationships that the position of the side chain since it is possible to position can have. That where the side chain is good mesostructure and mesostructure steric relationship located in the same direction is large relative to the main chain is higher isotacticity when viewed two consecutive olefin units in the backbone. Conversely, it refers to a three-dimensional relationship in which the side chain is located in the opposite direction relative to the main chain when viewed two consecutive olefin units in the main chain and racemic structure, syndiotacticity where racemic structure is often that high. Tacticity is used as an index representing the degree of stereospecificity. Tacticity is expressed in the presence ratio of mesostructure and racemic structures among a plurality of monomer units continuously. For example, when a plurality of monomer units the successive two called dyad, a case where the side chain is in the positional relationship between meso m, is expressed as r a case where the side chain is in the positional relationship of the racemic. If monomer units of three diad two notation positional relationship of the side chains of the positional relationship between the second and third monomer units of the side chains of the first and second monomer units are called triads (m and r ) using a mm, mr, and represented by a three rr. Isotacticity in triad notation is represented by the ratio of the meso triad mm [mm / (mm + mr + rr)], would represent an isotacticity the higher the value is high. α- olefin polymer obtained by the production method of the present invention has a number average molecular weight as measured by gel permeation chromatography (GPC) (Mn) of 1,000 to 30,000, wind power apparatus life and in the case of using the apparatus or the like, from the viewpoint of energy saving, more preferably a 1,500 to 15,000. Further, it is preferable that the ratio a is the molecular weight distribution of weight average molecular weight which is measured in the same manner using GPC (Mw) (Mw / Mn) is 2.5 or less for Mn, more than 2.0 more preferable. When the molecular weight distribution (Mw / Mn) is 2.5 or less, improved shear stability by reducing the high molecular weight component, and volatility is reduced by the low molecular weight component is reduced. Will now be described in more detail by the present invention embodiment, the present invention should not be construed as being limited thereto. The activity of the catalyst was evaluated in the conversion of the alpha-olefin polymer of a monomer after the polymerization reaction with the amount of catalyst used (alpha-olefin). Conversion, by utilizing the difference in the density of the monomer and α- olefin polymer was determined by the method of calculating the production amount of the density α- olefin polymer reaction. Specifically it is used in Examples and Comparative Examples 1-dodecene, 1-octene, 1-decene, respectively density at 15 ℃ 1-hexene 0.762g / ml, 0.720g / ml, 0. 745 g / ml, and 0.678 g / ml, 0.850 g of density in the density at 15 ℃ of polymer produced in 102 ~ 105 ° C. the reaction 0.846g / ml, 86 ℃ 15 ℃ of polymer produced in the reaction It was calculated as / ml. Density was measured according to JIS K 2249. Characterization of α- olefin polymer was carried out by the following method. (1) kinematic viscosity and viscosity index kinematic viscosity was measured conforming to JIS K 2283. Viscosity index, than the dynamic viscosity, was calculated conforming to JIS K 2283. [Macromolecules, 24,2334 (1991); Polymer, 30,1350 (1989)] was determined using 13 C-NMR according to the method described in. Manufactured by JASCO Corporation GPC-900 (column; TOSOH TSK-GEL MULTIPORE HXL-M (2 pieces) + Shodex KF801 (1 present)) using the device, solvent; tetrahydrofuran, temperature: 40 ° C., it was determined in terms of polystyrene. (4) was measured conforming to the pour point JIS K 2269. It was calculated with an equation. Nitrogen substituted 1000ml three-neck flask, placed and dry THF (tetrahydrofuran) 400 ml metal Na from about 13.8 g (600 mmol), the mixture was stirred at 0 ° C.. After 5 minutes, this was added dropwise cyclopentadiene 1 ~ 2 ml, After subsided occurrence hydrogen, newly cyclopentadiene 1 ~ 2 ml was added, repeated this was added cyclopentadiene total 50 ml (600 mmol). The reaction solution turned light pink colorless transparent. Was distilled off under reduced pressure THF, the crystals were washed twice with hexane, by causing vacuum to dryness to give the sodium cyclopentadienide as a pink powder. The THF457ml cyclopentadienyl sodium 43.0 g (480 mmol) was added and stirred at 0 ° C.. Was cooled to -78 ° C., was slowly added dropwise dichlorodimethylsilane 29.2 ml (480 mmol). The solution changed from pink to white. After stirring overnight at room temperature, it was evaporated THF, to give a yellow powder [Compound (1)] a. Compound (1) was extracted with hexane 150 ml, the supernatant was transferred to a 1000ml three neck flask was replaced with nitrogen. After cooling to -78 ° C., n-butyllithium (2.73 mol / l) was added dropwise 175.8ml (480mmol). The reaction solution became cloudy color from yellow. After stirring at room temperature overnight and freed from the supernatant by filtration. The resulting white solid was washed with hexane 100 ml. By drying under reduced pressure to obtain dilithium salt [Compound (2)] as a white powder. Compound (2) to 27.4 g (137 mmol) diethyl ether 50 ml, and hexane was added 100 ml. After cooling to -78 ° C., it was slowly added dropwise dichlorodimethylsilane 16.7 ml (137 mmol). After stirring at room temperature for 5 hours, the precipitate was removed by filtration, the filtrate was concentrated. Recrystallization from hexane compound as a needle-like transparent crystals (3) 4.05 g (12% yield). To 200ml Schlenk tube purged with nitrogen, the compound (3) 4.05g (16.6mmol) was stirred and dissolved in hexane 60 ml. After cooling to -78 ° C., n-butyllithium (2.73 mol / l) was added dropwise 12.1 ml (33.1 mmol), and stirred overnight at room temperature. After distilling off the solvent cloudy solution in vacuo, the precipitate was washed with hexane 20 ml. By drying under reduced pressure to obtain dilithium salt [Compound (4)] as a white powder. Toluene was added 34ml compound (4). To this suspension, toluene was added dropwise 51ml suspension of zirconium tetrachloride 3.9 g (16.6 mmol) at -20 ° C.. After stirring overnight at room temperature, the solvent was distilled off under reduced pressure to obtain the desired product [compound (5)] the. Compound (5) was extracted with dichloromethane 30 ml, and the filtrate was concentrated. After washing with hexane 10 ml, by drying under reduced pressure, (5) was obtained 500 mg (7.4% yield). The following results was determined 1 H-NMR of this thing is obtained. The following shows an example in 30 liters size autoclave. The internal volume 30 l stainless steel autoclave was sufficiently dried, after nitrogen substitution, it was subjected to activated alumina processing dodecene and 1-octene, respectively 8.0 kg (6.5 liters), 5.4 kg (7 .5 liter) were introduced, then placed triisobutylaluminum 2.7 mmol, and the temperature was raised to 95 ° C.. Hydrogen was introduced 0.02MPaG, it was continuously introduced at a rate of 18 ml per hour with a plunger pump of the catalyst mixture A. The catalyst introduced starting in after the temperature was maintained at 104 ° C. and allowed to react for 8 hours. The conversion was measured from 15 ℃ density of the reaction solution after. The conversion to the final copolymer was 88.3 wt%. N, to prepare a catalyst mixture B at N- dimethylanilinium tetrakis except that the amount of (pentafluorophenyl) borate was 0.48 mmol (384 mg) Example 1 and the same procedure. The polymerization of the monomers in the same manner as in Example 1 using a catalyst mixture B was performed. The final conversion to copolymer was 82.9 wt%. N, to prepare a catalyst mixture C in N- dimethylanilinium tetrakis except that the amount of (pentafluorophenyl) borate was 0.34 mmol (272 mg) Example 1 and the same procedure. Using a catalyst mixture C 80 ° C. The heating temperature before the catalyst introduction, the catalyst introduction rate 13.5 ml / hr, triisobutylaluminum 1.8 mmol, the polymerization temperature 86 ° C., and the catalyst feed time 4 hours except that the made a polymerization of the monomers in the same manner as in example 1. The final conversion to copolymer was 90.6 wt%. While using the catalyst mixture B of Comparative Example 1 was subjected to polymerization of the monomers in the same manner as in Example 2. The final conversion to copolymer was 78.2 wt%. Examples 1 and 2 in Table 1, as well as the catalyst preparation conditions of Comparative Examples 1 and 2, the polymerization conditions and reaction results. (B) / (A) the catalytic activity of less than 1 Examples 1 and 2, the same metallocene compound amount, as compared with Comparative Examples 1 and 2 of the reaction conditions, high conversion, and rather improved activity it can be seen that you are. After the completion of the reaction solution of Example 1 withdrawn about 300 ml, vigorously stirred was added 200ml of ion-exchanged water, allowed to stand under a reduced pressure of about 1.0 × 10 -4 MPa The organic layer was subjected to distillation at 200 ° C. , toluene was distilled off the residual monomers to yield a colorless transparent liquid. Furthermore, the thin film distillation apparatus (Shibata Scientific Co., Ltd. molecular distillation apparatus MS-300 special type, high vacuum evacuation device DS-212Z) under a reduced pressure of 2 × 10 -5 MPa using performs thin-film distillation at 180 ° C., carbon to obtain a polymer with Remove the number 24 or lower molecular weight components. After the completion of the reaction liquid of Example 2 withdrawn about 300 ml, by an operation similar to that in Example 3, to obtain a polymer with Remove the low molecular component having 24 carbon atoms. The results were analyzed by the method of (1) to (2) for Examples 3 and polymer excluding preparative low molecular components in distilled obtained in 4 shown in Table 2. Polymers obtained by the production method of the present invention is found to be a useful viscosity as high viscosity lubricating oil component. Put polymer excluding preparative low molecular components in distilled obtained in Example 3 in 1-liter stainless steel autoclave, 1% by mass of stabilized nickel catalyst (manufactured by Sakai Chemical Industry Co., Ltd. SN750) in a weight ratio of after the addition, the reaction was allowed to proceed for 6 hours under 130 ° C. of hydrogen 2 MPa. After the reaction, the reaction product was cooled to around 80 ° C. The temperature, the content was taken out and filtered off the catalyst components in the vicinity of 70 ° C. using a 1μm filter to obtain a colorless transparent hydride. The polymer was Remove the low molecular components in distilled obtained in Examples 4, carried out hydrogenation in the same procedure in Example 5 to obtain a colorless, transparent hydride. The results of the analysis by the method (1) to (5) for a hydride obtained in Example 5. and 6 shown in Table 3. α- olefin polymer obtained by the production method of the present invention is found to have useful properties as a high viscosity lubricating oil component. Following an embodiment in which changing the number of carbon atoms in the polymerized α- olefins. Except for changing the the the α- olefin polymerization using the catalyst mixture A 1-decene only conducted a polymerization of the monomers in the same manner as in Example 2. Conversion to homopolymer was 89.6 wt%. With changing the polymerized are α- olefins using a catalyst mixture A to 1-hexene and 1-decene, each addition amount, 7.2 liter, except for changing 10.8 liters Example 2 the polymerization of the monomers was performed by the same procedure. Conversion to copolymer was 90.4 wt%. With changing the polymerized are α- olefins using a catalyst mixture A to 1-decene and 1-dodecene, each addition amount 8.3 liter, except for changing 9.7 liter Example 2 the polymerization of the monomers was performed by the same procedure. Conversion to copolymer was 86.8 wt%. By using the manufacturing method of the present invention, can be produced with a small amount of catalyst useful α- olefin polymer as a high viscosity lubricating base oil, also can be easily manufactured industrially, low fuel consumption required for a lubricating oil, energy saving can contribute to longer life. Two cross-linked metallocene compound represented by (A) the following formula (I), the (B) the two-bridged metallocene compound reacting with ionic compounds may be converted into cations, and (C) an organometallic compound, the ( using a polymerization catalyst for a) the molar ratio of the relative two bridged metallocene compound (B) an ionic compound is used in 0.5 and 1.0, polymerizing number 4 ~ 20 alpha-olefins one or more carbon atoms method for producing α- olefin polymer characterized by having a step. (B) the ionic compound, method for producing α- olefin polymer according to claim 1 is a coordination complex compound represented by the following general formula (2) or (3). Formula (2) and M 2 and M 3 in (3), the production method of the α- olefin polymer according to claim 2 is boron. (B) the ionic compound is cationic and the method for producing α- olefin polymer according to claim 1 is a coordination complex compound comprising a non-coordinating anion represented by the following general formula (4) . Wherein R 11 ~ R 14 in the general formula (4) are each independently method for producing α- olefin polymer according to claim 4 is a substituted or unsubstituted phenyl group. (A) the two cross-linked to metallocene compound (B) method for producing α- olefin polymer according to any one of claims 1 to 5 molar ratio of the ionic compound is 0.5 to 0.9. Wherein (C) the production method of the α- olefin polymer according to any one of claims 1 to 6, an organometallic compound is an organoaluminum compound or an organozinc compound. Method for producing α- olefin polymer according to any one of claims 1 to 7 carbon atoms in the α- olefin is 8-14. Method for producing α- olefin polymer according to any one of the kinematic viscosity at 100 ° C. the resulting α- olefin polymer is 30 ~ 1000mm 2 / s at which claims 1-8. The process according to any one of claims 1 to 8 to produce a α- olefin polymer, method of manufacturing a hydrogenated α- olefin polymer, which comprises hydrogenating the α- olefin polymer. Method for producing a hydrogenated α- olefin polymer according to claim 10 kinematic viscosity of 30 ~ 1000mm 2 / s at 100 ° C. of the resulting hydrogenated α- olefin polymer. EP0524624B1 (en) 2002-05-15 Use of organometallic flurorenyl compounds.